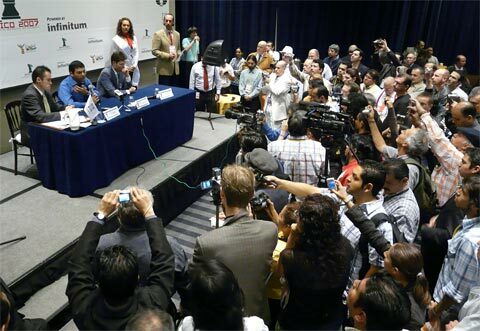 ChessMaine: Mexico City Round 14: Viswanathan Anand is world champion! 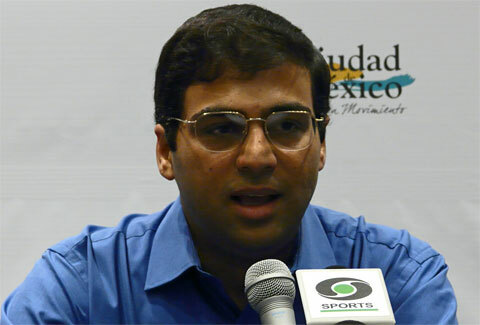 Mexico City Round 14: Viswanathan Anand is world champion! 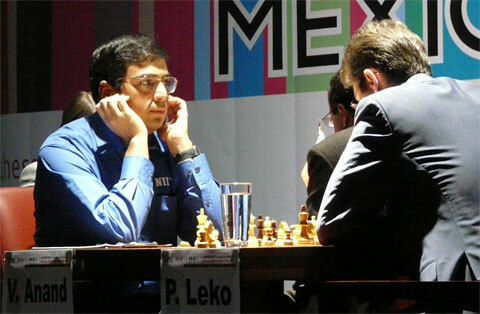 09.29.07 With a final round draw vs. Peter Leko, Vishy Anand has clinched the world championship title. 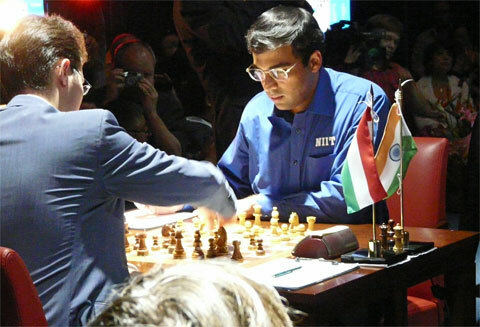 Undefeated in this fourteen round tournament, Anand turned in a performance rating of 2848 to take his place amongst the lineage of world chess champions beginning with Wilhelm Steinitz in 1886. Congratulations Vishy! 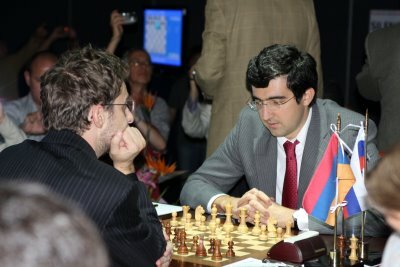 Kramnik fought back in the last round to beat Aronian and tie for second place with Boris Gelfand who drew with Morozevitch. Leko and Anand begin their last round game. Anand playing a safe and sound variation of the Ruy Lopez with white. 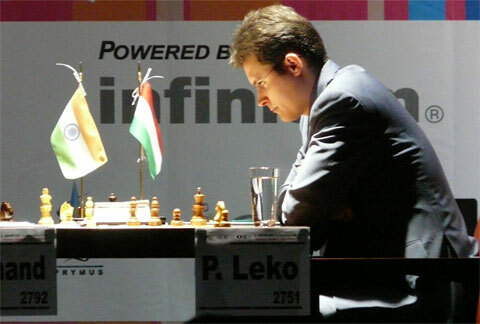 Leko decides there is nothing there and takes the draw. The new champ speaks to the press. 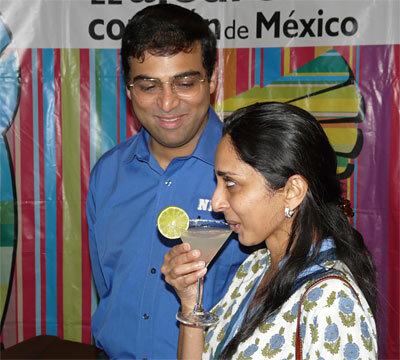 Vishy and his wife Aruna share a celebratory drink after the game. Throngs of fans and reporters swarm the newly crowned king. Meanwhile Kramnik moved into shared second place with his win vs. Aronian. 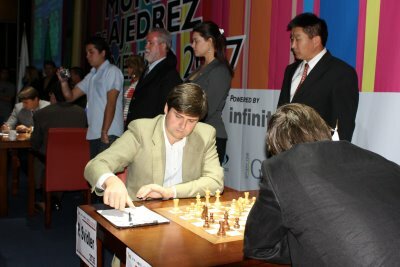 Beating Morozevitch with the black pieces is a tall order. Gelfand plays it safe, does not over extend himself, takes the draw and secures shared second with Kramnik. Better late than never: Peter Svidler wins his first game of the tournament in the last round vs. Alexander Grischuk to finish in fifth place. A final look at the new world champion Viswanathan Anand. Anand's is a performance rating of 2848 not an actual rating. For instance, Anand is rated 2792. The results he has provided would be normal and expected for a player rated 2848, so he has played 56 points above his nominal rating. Thanks for the comments. Wow! Vishy has 2848! That's 48 points above Bobby Fischer's (did i spell that right?) top score! I played a guy w/ a 2050 score once. I made it through the middle game but he pulled a tricky checkmate on me w/out notice. I played him straight up too! I got 2 of his pieces. Why am I telling you this and why did i subscribe to ChessMaine when I live in VA? Thanks for keepimg us posted Dan, good job as usual.